After I landed myself a John Lewis voucher through the survey reward site Valued Opinions, I spent hours searching for a little something to spend it on. I finally settled on on the YSL Rouge Volupte Shine lipstick in Pourpre Intouchable. I find the YSL lipsticks to be a luxurious item that I wouldn't normally convince myself to purchase because of the price tag, but they receive such great reviews and I couldn't pass up the opportunity to get myself £10 off. Pourpre Intouchable is a stunning deep berry laced with shimmer. It's a sheer but buildable colour that glides onto the lips with ease, keeping them smooth and moisturised. I find that the shimmer in the bullet doesn't particularly translate onto the lips, creating a glossy appearance rather than the disco ball effect. I get about 2-3 hours wear out of this particular shade. It fades quickly when eating or drinking but reapplying is effortless. Now let's talk packaging. It definitely reflects the price tag, housed in a gold casing and a band that is reflective of the colour inside. These lipsticks deserve to be out on display rather than thrown to the back of a drawer. I couldn't shell out £24 for one of these very often, but as a treat? It's worth it! This is a beautiful shade! I think I want to pick up this shade when I decide to buy one of these lovely YSL lippies! The prettiest packaging around! I'm asking for one of these for Christmas, can't wait to get my hands on it :) amazing pictures, Amy, that first one is incredible! Beautiful shade too! 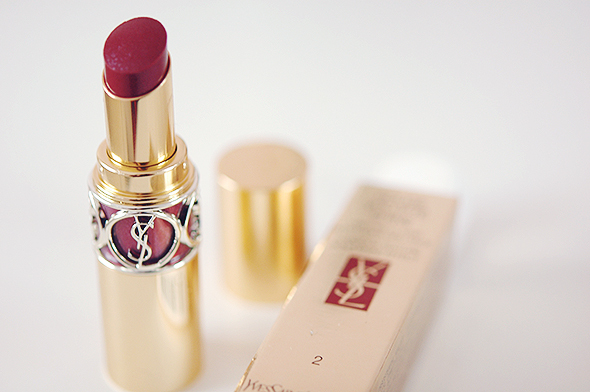 I love the look of YSL lipsticks and this is a gorgeous shade. So gorgeous! I would love one of these at some point but they are definitely only treat worthy or gift worthy, so expensive. YSL lipsticks have the best packaging. That shade looks amazing as well. I love picking up YSL lippies whenever I can. They are such a luxury and I just adore them! This is just beautiful colour and looks perfectly fitting for the season. Reminds me a bit of my all time favourite Chanel Rouge Coco Shine in 61 Bonheur.